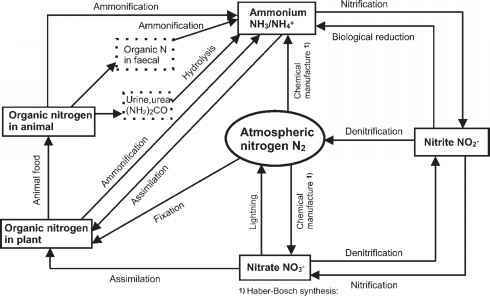 The anaerobic degradation of organics is a rather complicated process. Even if we only wish to discuss the digestion of glucose, we must take into account three different groups of bacteria. It is not easy to separate them and, in the case of conversion of propionate to acetate and hydrogen, the acetogenic and methanogenic bacteria are dependant upon each other. Although it is important to know the value of X, the bacterial concentration responsible for one interesting catabolic reaction, measurements are frequently impossible and X must be obtained by calculations using mass balances. are used in Monod or Haldane kinetics instead of cHAc and cHPr in recent publications. The next important point is to calculate how much methane is produced if 1 mol CH3COOH or 1 mol C6H12O6 is degraded anaerobically. We can compare both substrates according to their COD. Let us start with CH3COOH. Therefore, 1 mol C6H12O6 needs 6 mol O2; or 180 g C6H12O6 is equivalent to 192 g COD. regardless of whether polysaccharides, monosaccharides or acetate are present in the wastewater.